76 mm/40 41st Year Type5 х 1 pcs. 180 Degree Turn Time16.36 sec. Initial AP Shell Velocity690 m./s. 457 mm Twin2 х 2 pcs. 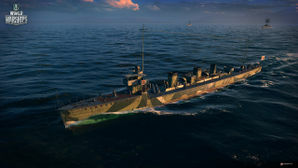 Tachibana — Japanese promo premium Tier II destroyer. A small and relatively fast destroyer. For her size, Tachibana boasted a sufficiently powerful torpedo armament. The ship's artillery comprised several rapid-fire small caliber guns. Tachibana was first released for sale worldwide on 25 May 2016 after having been available for free via a series of in-game missions in February 2016. As a Premium ship, Tachibana doesn't have any upgrades to research. Tachibana can install only one upgrade. Main Armaments Modification 1 is recommended, or Magazine Modification 1 ( ) for players who strongly dislike detonations and would like to lessen their potential. Players with few credits are advised to exercise care in selecting premium consumables as Tier II premium ships are poor credit generators. As a Premium ship, Tachibana comes included with Type 9 camouflage that lowers her detection radius, reduces the accuracy of incoming shells, and increases the amount of experience she earns. Players who dislike detonations may wish to equip Juliet Charlie ( ). Sierra Mike ( ) can be used, in conjunction with the Engine Boost ( ) consumable, to attain a maximum speed of 33 knots. Victor Lima ( ) and India X-Ray ( ) can, when used together, increase the fire chance of HE shells by 1%, or 3% total if the captain has Demolition Expert as a chosen skill. Juliet Whiskey Unaone ( ) will increase the chance of flooding and thus the efficiency of Tachibana’s torpedoes. The Tachibana was a Sakura-class destroyer built for the Imperial Japanese Navy between 1911 and 1912. The primary difference between the Sakura and Umikaze class were the types of engine; with the former being powered by vertical expansion engines and the latter by Parsons turbines. She served for 20 years before being decommissioned in 1932 and scrapped in 1933. This page was last modified on 17 May 2018, at 19:34. This page has been accessed 40,592 times.